According to research done by Go Compare, kitchen DIY renovations and improvements were at the top of UKs home renovations in recent years. There has been a growing trend to transform the kitchen to a solely functional room to the heart of the home. On your mobile and already raring to go? Search our DIY products now. If your laminate kitchen worktop has seen better days and resembles custard more than sparkling white, consider updating your kitchen worktop with a new coat of paint. Aging, damaged and worn out kitchen worktops, or countertops, can now be refreshed with worktop paint. 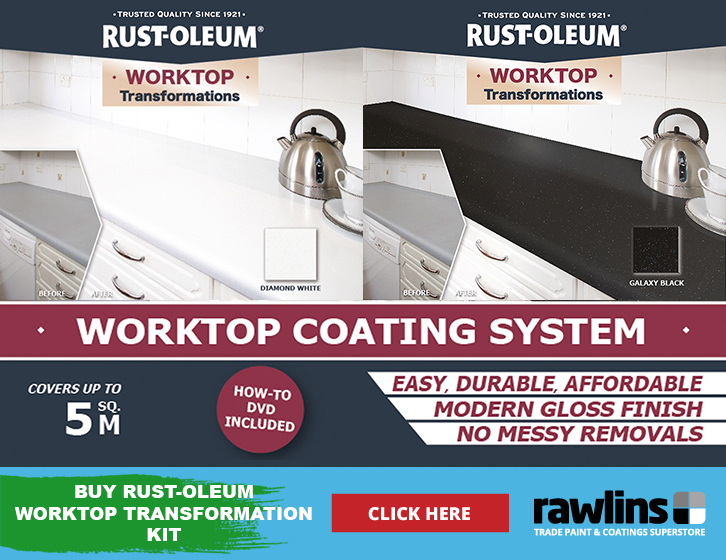 Rust-Oleum’s Worktop Transformation Kit is an affordable solution to transform those out-of-date worktop designs or get rid of stains that haven’t budged in years. This kit is suitable for both private home-owners and commercial usage. So if you are a landlord, are looking to update a school or bar kitchen, the Worktop Transformation Kit will be a great way to update your worktops. This kit comes in Galaxy Black and Diamond White and it is perfect for a Bank Holiday DIY project. Consisting of two separate coats of paint, you will be able to use your kitchen again after just 48-52 hours. Your new kitchen worktop will be fully ready for heavy use after a drying period of 7 days. This product has a gloss finish and it is highly durable. You will be able to enjoy your rejuvenated kitchen worktop for years to come! You don’t have to completely tear down your kitchen for that newly renovated look. If you have just moved house – perhaps as a business owner looking to update an old kitchen for a restaurant or café relaunch – giving aging tiles a fresh lick of paint can work wonders. Whether you aim to cover up an outdated pattern, or you simply do not like the colour of the tiles, there are various paints that allow you to update your tiles to something more to your liking. If you are looking for a stark white finish, Rawlins Paints stock the Rust-Oleum Tile Transformation Kit. This kit holds everything you need to update your tiles to a stark white finish. It comes in the colour Aspen White and the tiles will be fully dried after just 24 hours. 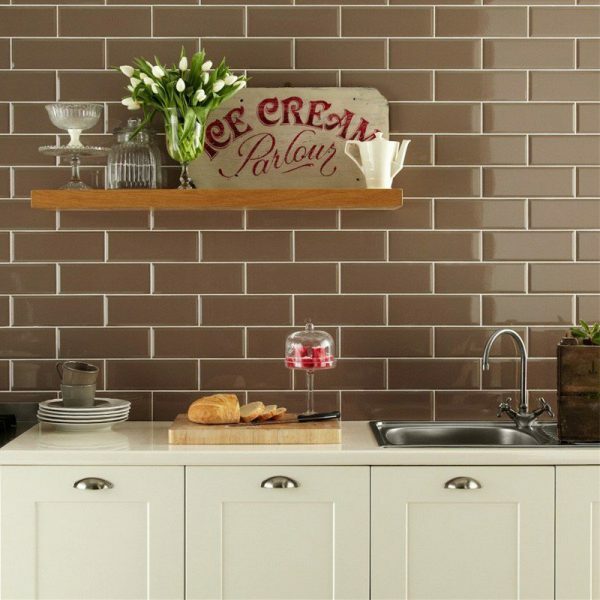 If you are looking to add a little colour to your kitchen, we also carry the Coo-Var Tile & Melamine Primer. This primer is specifically designed to be used on tile and melamine surfaces and after the tiles have been primed, nearly all paints will adhere to it. Using this tile primer also means you have free reign over the colour of your tiles. Ensure you work with a test patch to check that your selected colour works with the Coo-Var Tile & Melamine Primer. Kitchen DIY tip 3: No tiles? No problem! If you want the effect of tiles in your kitchen, but you don’t actually have a tiled backsplash in your kitchen, you can create the effect of tiling with paint, tape and patience. Whether you cannot afford tiling, or you are not ready to commit to a specific tile, you can look to online tutorials for inspiration. This couple created the effect of tiling in their kitchen by clever use of suitable paint. Ensure to select the right kind of paint for your project, especially when painting over another surface. You will need something that is durable, heat-resistant near the stove and a paint that can be scrubbed should a kitchen mishap take place. Creating a faux tile effect takes time and patience, and a good amount of calculations, so be prepared for this time-consuming but rewarding project. This might be a straight forward tip, but if you have an outdated kitchen, the easiest way to get quick results is to paint those kitchen cabinets in a colour more to your liking. Whether you have oak cabinets you are no longer fond of, there are many options out there to get the finish you want. Pinterest will be a great source of inspiration on how to update your kitchen to something more of this decade. Repainting your kitchen cupboards will not be a super quick job – well, perhaps it will if you have a tiny little kitchen! Carrying out the correct preparations is instrumental in getting the finish you are after. Also, be realistic about your expectations. If you’re not a dyed in wool DIYer, then take your time to get it right. Ensuring your cabinets are properly sanded, grease-free, and taped up is just as important as the painting itself. If you are working with cabinets that are slightly damaged and have big dents or even holes, use a suitable filler to get rid of these. Although it might be tempting, do not skip over the step of priming your cabinets. When painting over wood, the knots in the wood can start bleeding through after a few weeks, or worse, the colour of paint you’re trying to get rid of bleeds through your fresh paint. By using a suitable primer, this DIY mistake waiting to happen can be avoided. Whilst a primer and paint in one are great for many projects, repainting your kitchen cupboards is not one of them. 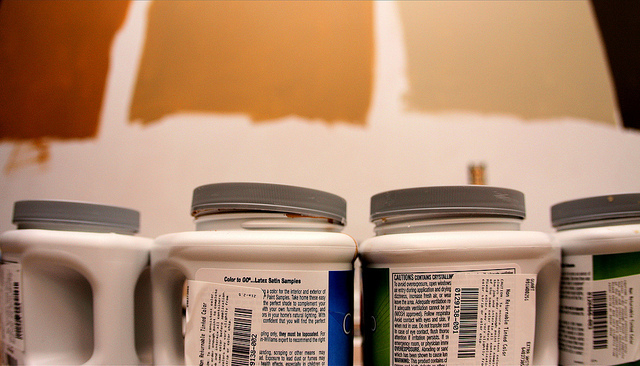 Pick a paint that is durable, will harden out and that might even be scrubbable. The hardest part might be selecting what colour and what type of finish you want. If you cannot decide between a glossy, satin or matt finish, work with some test patches in your kitchen to see what effect you like most. We give the same advice to people who are undecided on what colour they want. By working with swatches, or test patches of paint, you can give various colours a trial run before actually committing to the colour. Ensuring the selected works with your backsplash as well as your kitchen appliances is important; the last thing you need after this type of project is feeling like you made the wrong choice! Check here to find the right colours for your kitchen renovation and remember, whatever the size of the kitchen DIY project, there are many decorating, cleaning and refurbishing options available, here at Rawlins Paints. A fantastic breakdown to renovating your kitchen tiles and cabinet, love the pictures. Certainly injecting new life into the kitchen. As a longstanding DIYer, I’m always impressed by the clear language and helpful tips in Rawlins’ notes. Thank you for covering such a range of topics in decent English wording: – really understandable and informative. Thank-you Jay, such nice feedback to receive on a grey and rainy Friday! I am tempted by using a tile paint – please could you let me know if I can regrout afterwards as I am keen to have a slightly contrasting coloured grout. Thank you. This would have to be a very careful process by painting the tiles and trying not to cover the existing grout as it may stop the new grout adhering. So best way to proceed may be to paint the tiles, then prepare all the grout lines by scraping/clean back to ensure clean, sound grout for the new grout to be applied to. Only attempt to re-grout after the paint has fully cured (can be up to 1 month depending on which product is used).